Big families: Hey, folks, we need MORE of them! Everybody should have at least one sister or brother. Oh, I know; lots of people nowadays would scoff at that passage, as well as many others from the Good Book, as many called it when I was growing up. But I’m not talking about religion here. Not directly, anyway. So often in these modern times, you’ll hear people talk about, “Oh, children are expensive; just have one, or two at the most.” Or, “A woman must pursue her career when she’s young and energetic. She can wait and have her child — or children — later on, after she’s in her 30s and more securely established.” Well, that’s the modern way of looking at things, I guess. But is it what’s best for the kids? As you might have guessed by now, I don’t think it is. Now, I hope you’ll hear me out. 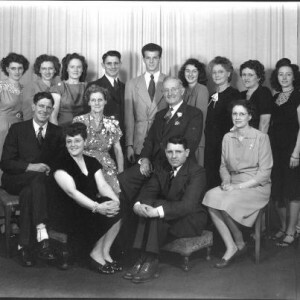 My mother was one of 13 children; my father, one of five. Farm kids. They grew up knowing that work was expected of them, that they were part of a family, meaning that the older ones helped take care of the younger ones. Those people who believe nowadays that in large families, the “poor mother” rushes around trying to take care of a houseful of screaming children, while the father is either absent, or sitting around drinking beer or taking drugs, don’t know what they’re talking about. What is an only child likely to be like? Spoiled, for one thing. I guess I was, in a way, although Dad and Mom certainly didn’t have the money to “spoil” their little darling like a lot of parents of just one child do. But when you’re the one and only, you’re likely to be watched and “protected” more carefully by your parents than if you’re one of seven or eight. Or even just four. You’re the only one they’ve got, so they treasure you like you were gold-plated. You’re their precious little singleton. And that’s not healthy for either them, or you. The Quiverfull Movement, a fundamentalist Christian group, stresses having as many children as is practical for the earning potential of the parents — or, more likely, the father, since the mother is likely to be pregnant a good part of the time. 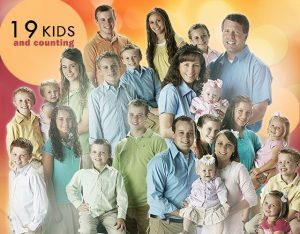 The famous Duggar Family, with 19 children, is part of that movement. Members of the Church of Jesus Christ of Latter-day Saints — the Mormons — have traditionally raised more children per married couple than the average for the entire U.S. As the overall fertility rate — the average of the number of children born to each woman of maternity age — has declined, so has the rate for the LDS families. But they still come in at No. 1 among major Christian groups. Of course, the Amish, that fundamentalist Christian group which shuns driving, modern dress, and a number of other things, have a very high fertility rate. But with their extensive farming and employment in construction and other areas, they manage their big families reasonably well. Orthodox Jews also tend to raise a lot of children. In their case, however, they tend to dip into the federal give-away trough a little heavily, in my opinion, as the adult men among the Orthodox tend to spend most of their time studying the Torah and the Talmud. And I might add, in regard to the last paragraph, large families should be INTACT, responsible families. We don’t need any of these 25- or 30-child collections fathered by irresponsible black men (yes, it happens) in some of our big cities, by six or seven different women. These men are worthless bums, who still adhere to a tradition from their African ancestral homeland of fathering just as many children as possible. Not necessarily being a good father to them, or supporting them. Just get as many women pregnant as possible. Now, it could be that there have been White American men who have done the same thing, and if so I condemn them equally. But I haven’t heard of any. Not in those numbers, anyway. As to my own life, obviously I survived being an only child, and growing up in a neighborhood where there weren’t any other kids my age who lived close enough that I could run over and play with them frequently. It affected my personality; made me into an addict to the TV screen, to books, to writing stuff myself, and drawing pictures. The stuff you don’t have to have any help to do. But it made me kind of an oddball, too. I never learned to do some of the things that we just naturally expect all kids to master easily. And I did develop some habits — or pastimes, or whatever you want to call them — that, over time, gave me a creepy image, in some people’s eyes, in my home town. Never mind; I don’t tell everything I know. But here’s a parting piece of information, and my assessment of it. I wouldn’t have been an only child, if Dale William Engle had survived. He was my older brother, born in 1928, a year after my parents married. He died at birth. And my parents didn’t have another baby until January of 1945, when I was born. Dale would have been in high school by the time I was born. But, he would have been my big brother. Maybe he could have taught me some things that I should have learned, but didn’t. Even if he had been out and gone by the time I knew anything, to college, a job, the Army, whatever. But at least I would have known I had a big brother; that I wasn’t that victim that I hated: the only child. Gosh, Dale: I never knew you; but I’ve always missed you. Enjoyable read, Old Corporal. I was lucky to be one of a large family. You made me feel even more fortunate. Thanks. Thank you, Anonymous. I hope others enjoyed it, too, and that they will post comments about it.